How do you pick the next stock to invest in? One way would be to spend hours of research browsing through thousands of publicly traded companies. However, an easier way is to look at the stocks that smart money investors are collectively bullish on. Hedge funds and other institutional investors usually invest large amounts of capital and have to conduct due diligence while choosing their next pick. They don’t always get it right, but, on average, their stock picks historically generated strong returns after adjusting for known risk factors. With this in mind, let’s take a look at the recent hedge fund activity surrounding Norfolk Southern Corp. (NYSE:NSC). Norfolk Southern Corp. (NYSE:NSC) was in 47 hedge funds’ portfolios at the end of the fourth quarter of 2018. NSC has seen a decrease in activity from the world’s largest hedge funds recently. 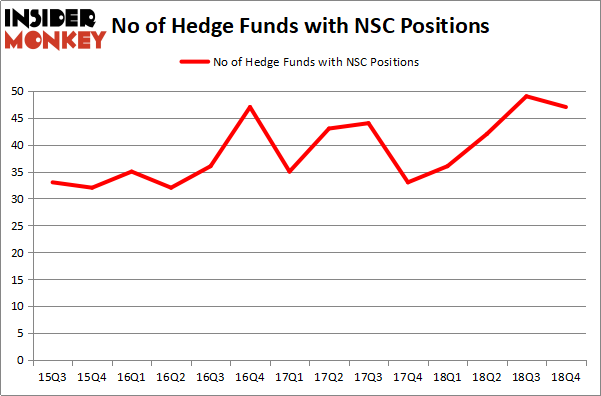 There were 49 hedge funds in our database with NSC positions at the end of the previous quarter. Our calculations also showed that NSC isn’t among the 30 most popular stocks among hedge funds. However, overall hedge fund sentiment towards the stock is still very close its peak in recent years. We’re going to take a look at the new hedge fund action encompassing Norfolk Southern Corp. (NYSE:NSC). How have hedgies been trading Norfolk Southern Corp. (NYSE:NSC)? At the end of the fourth quarter, a total of 47 of the hedge funds tracked by Insider Monkey held long positions in this stock, a change of -4% from one quarter earlier. Below, you can check out the change in hedge fund sentiment towards NSC over the last 14 quarters. So, let’s examine which hedge funds were among the top holders of the stock and which hedge funds were making big moves. Of the funds tracked by Insider Monkey, Eric W. Mandelblatt and Gaurav Kapadia’s Soroban Capital Partners has the biggest position in Norfolk Southern Corp. (NYSE:NSC), worth close to $405 million, amounting to 8.5% of its total 13F portfolio. Sitting at the No. 2 spot is Impala Asset Management, led by Robert Bishop, holding a $162.4 million position; 8.8% of its 13F portfolio is allocated to the stock. 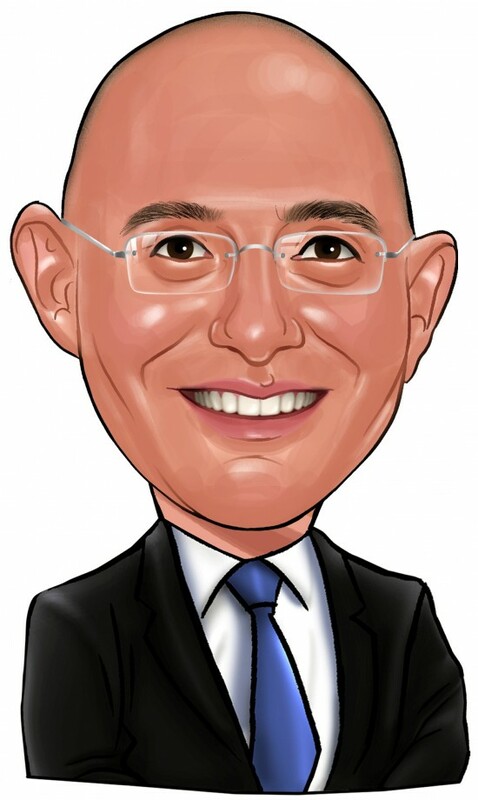 Some other professional money managers that are bullish comprise Matt Simon (Citadel)’s Ashler Capital, Cliff Asness’s AQR Capital Management and Andrew Immerman and Jeremy Schiffman’s Palestra Capital Management. Since Norfolk Southern Corp. (NYSE:NSC) has witnessed falling interest from the smart money, it’s safe to say that there exists a select few funds who were dropping their full holdings last quarter. Intriguingly, Zach Schreiber’s Point State Capital dumped the largest stake of the “upper crust” of funds watched by Insider Monkey, valued at close to $218.2 million in call options, and Alexander Mitchell’s Scopus Asset Management was right behind this move, as the fund dropped about $135.4 million worth. These moves are interesting, as aggregate hedge fund interest fell by 2 funds last quarter. Let’s now take a look at hedge fund activity in other stocks similar to Norfolk Southern Corp. (NYSE:NSC). We will take a look at ABB Ltd (NYSE:ABB), Metlife Inc (NYSE:MET), Regeneron Pharmaceuticals Inc (NASDAQ:REGN), and Relx PLC (NYSE:RELX). This group of stocks’ market caps resemble NSC’s market cap. As you can see these stocks had an average of 19.25 hedge funds with bullish positions and the average amount invested in these stocks was $629 million. That figure was $1521 million in NSC’s case. Regeneron Pharmaceuticals Inc (NASDAQ:REGN) is the most popular stock in this table. On the other hand Relx PLC (NYSE:RELX) is the least popular one with only 5 bullish hedge fund positions. Compared to these stocks Norfolk Southern Corp. (NYSE:NSC) is more popular among hedge funds. Our calculations showed that top 15 most popular stocks among hedge funds returned 19.7% through March 15th and outperformed the S&P 500 ETF (SPY) by 6.6 percentage points. Hedge funds were also right about betting on NSC as the stock returned 20.7% and outperformed the market as well.